Since my secret baby blanket has now touched down in Houston, I can share the vast number of pictures I took before I entrusted it to the vagaries of the mail service. Yarn: Patons UK 100% Cotton DK, 230 yds/100 gr skein, less then one skein each of white, red, brown, turquoise, green and yellow. 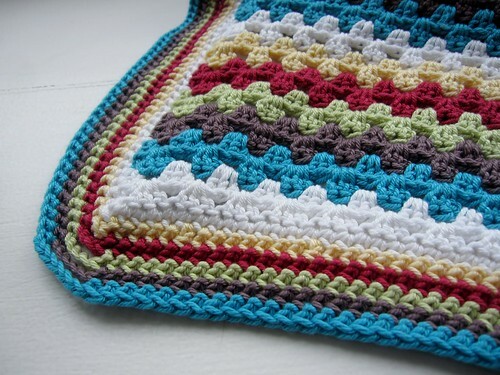 Comments/Modifications: This is my first crochet project bigger then a potholder, so I spent a fair bit of time trolling the web for reasonably straightforward baby blanket patterns. 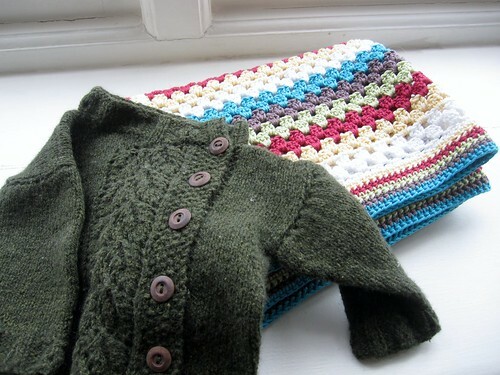 Lucy's blog is chock full of clear tutorials, beautiful photography and so much enthusiasm that I'm a bit surprised I haven't burned my knitting needles in effigy. (OK, maybe not that last bit, but it's a great blog.) Since her tutorial was much more a recipe then a straight pattern, I had to do a bit of swatching and planning of the color sequence. I ended up working six repeats of the following color sequence - white, yellow, red, green, brown and blue - and then added one more white stripe to make a bit more symmetrical. 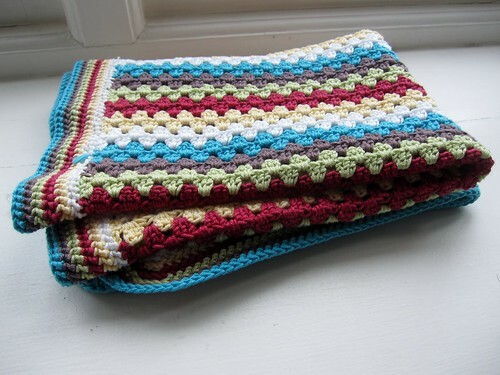 I also wanted to some kind of border, so I picked up stitches all the way around the edge and worked a border with a stripe of each color in half-double crochet (or double crochet if we want to stay true to the UK terminology). 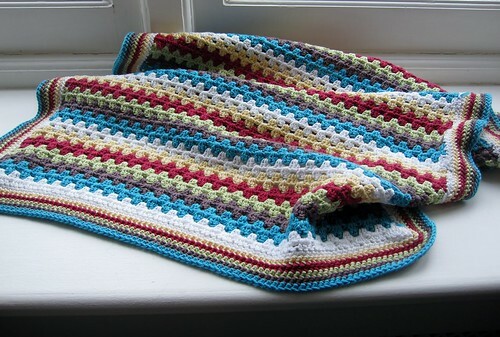 The final blanket was approximately 26 inches wide by 36 inches long. 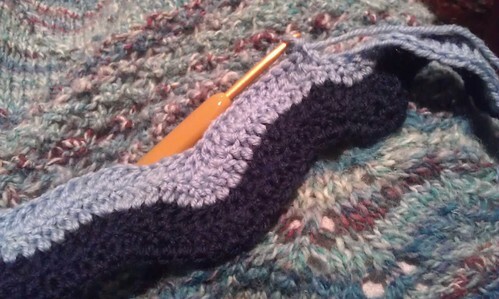 At each corner I chained stitches to bridge the gap, increasing one stitch at each corner on each subsequent row. I probably could have done more chain stitches, or done increases in the stitches from the previous round - this treatment resulted in corners that don't lie perfectly flat. In fact, the whole border ripples laong the edges, proof positive that my crochet gauge is probably not that consistent yet. 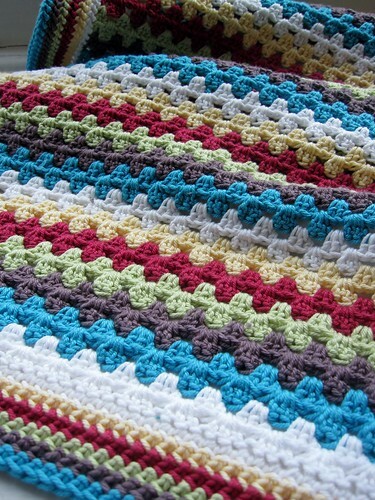 I loved doing this blanket. It was quick, relatively straightforward for this beginning crocheter, and I'm really pleased with the results. As is the impending new mom, which is the most important thing! I sent it off to Houston along with a Peapod Cardigan I knitted a while back but hadn't found an ideal model for yet. And the best news? Now that I've finished my second crocheted baby blanket, I'm well into my third. That was my beginning on Friday night, and now I've got 15 16 stripes done. Total. Crochet. Addiction. 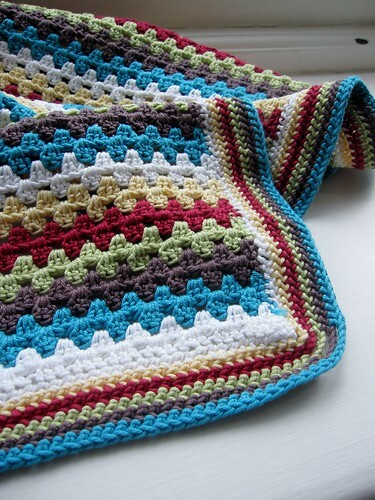 Written by porpoise On March 4, 2013 In "FO", "baby", "blanket", "crochet"